The other day, when I felt tired and sick, I did take the time to start to throw something together, thinking if I had something ready to needle felt, I’d work on it while the other students did their project. 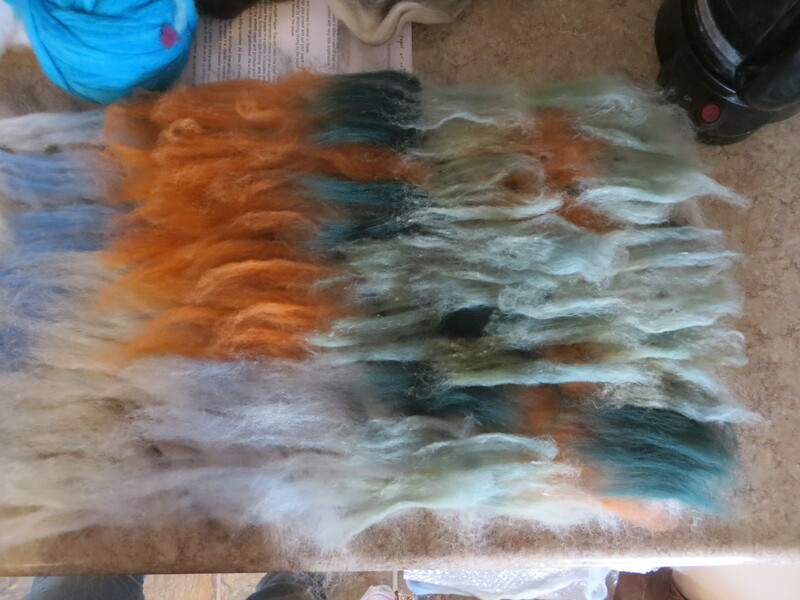 Billie Jo had sold me some cool roving, made when they were switching to different colors of wool… which resulted in a striped roving. I decided to make a long winter neck scarf. After a debate, I decided to see if I layed this on the diagonal, if the second layer might show through enough to create a diamond effect. I’m also using a Christmas present… potato paper called ArtFelt (affiliate link). 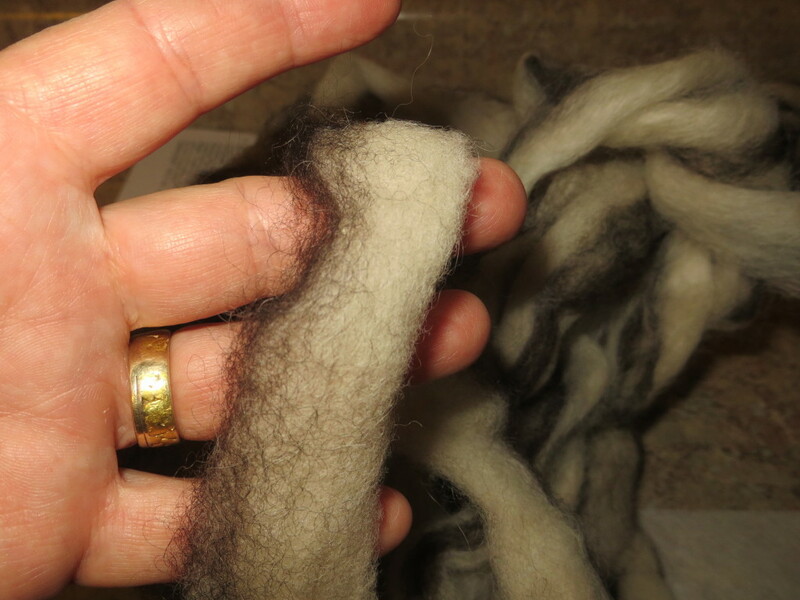 It is supposed to speed the wet felting process. 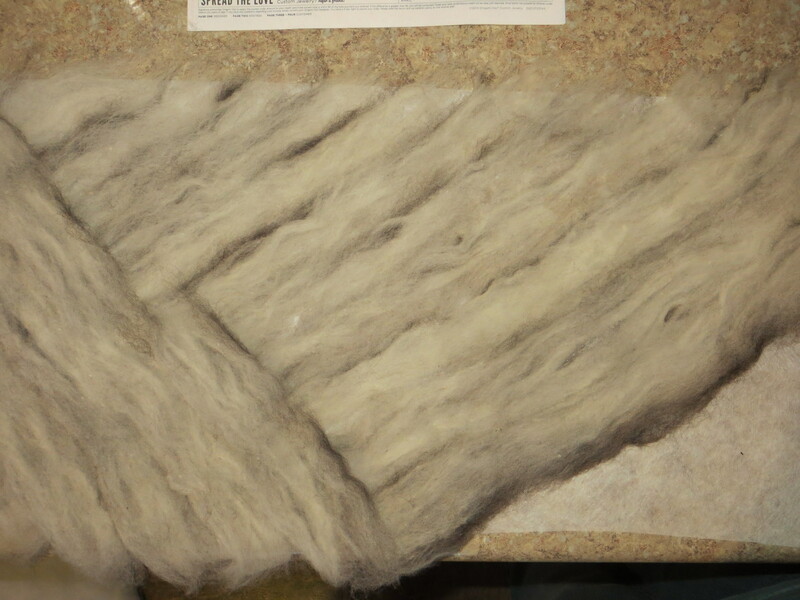 I want this to be very warm, and two layers used all my striped roving. All righty… I’m going to make a scenery side. I start pulling the roving and laying out rough background colors for the third layer, later I’ll be getting some more detail onto the fourth and decorative layer. I’m cruising along… Hmmmm. Wool will shrink an average of 30%. This will be too short! I don’t have enough of the right colors. Well, poop. OK. Fine. I added another foot on each end with a simple brown roving. Then I added fringe. The scarf takes up my entire counter!!! Wouldn’t you know it? I ran out of sky blue. I can’t finish it. The blue really should have been MUCH bigger and I should have left off of the brown ends. But there is NO WAY I couldn’t have a blue sky! This scarf WON’T be finished in order for me to needle felt some wildflowers onto it tomorrow! I’m bummed. The good news??? I’m asking Billie Jo to bring me some more roving over tomorrow and then I’ll decide… take off the brown ends and add more blue sky? or just see what this looks like! Opinions??? FYI. There’s still a couple of slots open if you’d like to join us!!! LOL I haven’t been by for a few days and I started with your Wool Valentine’s post. I thought “That just has to be Artfelt” because I have been experimenting with it as well lately! Can’t wait to see how your scarf came out. Looks like a lot of creative fun!! I agree about needing more blue as a cheerier color. 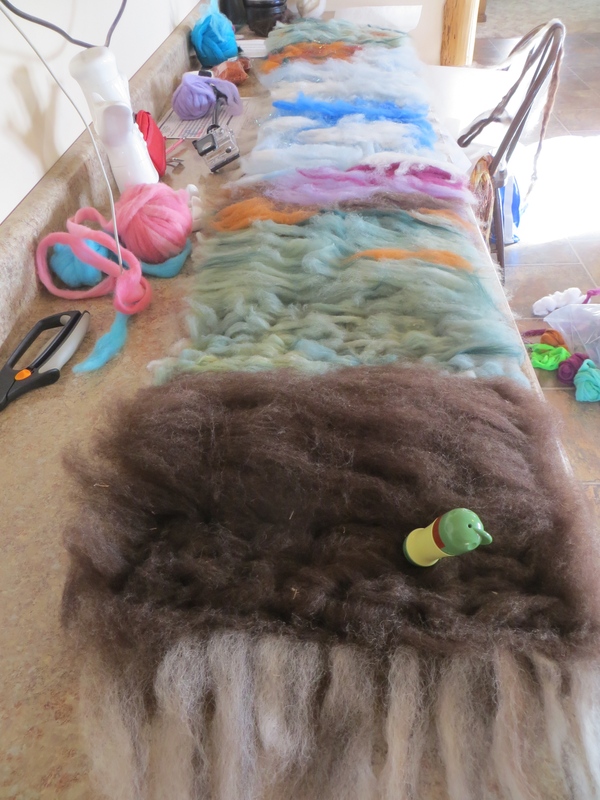 How do you use ArtFelt compared to wet felting? Like Mary C I would also enjoy being there with you but alas the POND is in the way. Don’t know much about felting but I have a friend who has done wonderful books for her grandkids similar to your needle felt bag. Your colours look great. Do you want colours to cheer you up in winter? Then more blue. If you want to tone in with the weather then the brown with wild flowers to brighten the scarve. Have a fun day. The brown ends on the scarf could work but I think the brighter colors would look better.